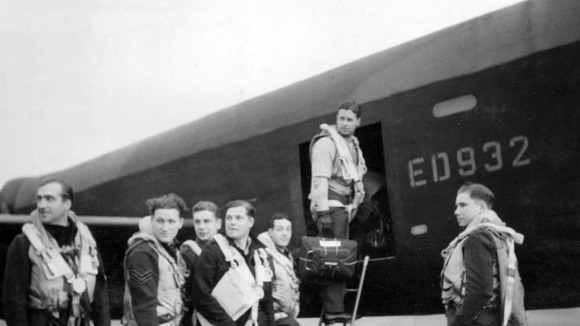 A photo to celebrate today's 70th anniversary of the 'Dambusters' raid over the dams in Germany. 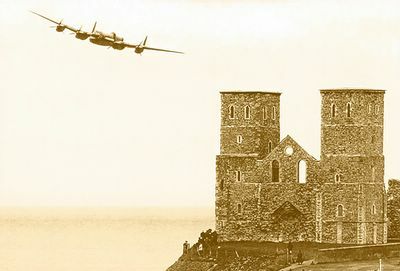 Operation Chastise, was a pivotal mission of the Second World War, using Barnes Wallis' legendary 'Bouncing Bomb' which was refined in practice runs by the pilot's of the RAF's 617 Squadron, along the coast here with beach at Reculver Towers as an aiming point. The targets between 16-17 May 1943 were three water dams in Germany's Ruhr industrial region. Two on the rivers Möhne and Sorpe, and a third on the River Eder. If anyone locally is still surviving, who perhaps saw this training take place as a young man or woman, it would be wonderful to hear their story. Returning to the present, which is far less exciting, it's the annual general meeting of Thanet District Council tonight. This is when we witness the local 'Game of Thrones,' to determine who controls the three most important committees, as well as the appointment of a new Chair of Council. Tonight of course, we not only have new microphones but two new members of UKIP sitting in the chamber, Zita Wiltshire and Roz Duncan and they will be looking to be recognised as a minority presence, alongside Cllr Worrow's surviving TIG party with Cllr Dr Jack Cohen and Cllr Tom King's Independents, Cllr Bob Grove and occasionally Cllr Ian Driver. Clive Hart and Labour are clinging-on to a minority administration and need the independent vote to stay in place. So one may expect that Cllr Worrow and Cllr Cohen will hang on to the 'plum' committee jobs of Planning and Finance, in return for their votes, even though they have consistently proved themselves wanting. What happens to Cllr Ian Driver after his most recent series of outbursts is another question. Labour badly need his renegade vote but they simply can't afford the association with his toxic left of left wing personality politics as the County election result proved last week. On a further note, a source tells me that a member of Labour's front bench is the subject of two separate bullying complaints from council staff. If this allegation is correct and I will leave the local paper to investigate, it's a very poor reflection indeed of their trades union credentials. Lastly, the BBC's Sunday Politics Show, this coming weekend, looks set to have a beauty contest between Colonel Roger Latchford, Will Scobie and me. I was interviewed in the rain on Margate's harbour arm yesterday afternoon and young Scobie, as he pointed out to me in a Twitter message, was interviewed in the sheltered warmth of the Cup Cake Cafe (a new political nickname perhaps?) Roger Latchford, UKIP's new leader at KCC, was interviewed in Ramsgate and one can only guess what he was up to? Which one of us puts up the worst performance remains to be seen and I might put up a poll on Sunday morning for anyone who can bear to watch the result. Perhaps "Cupcake Face" which would "Cue Face Pack"
Interesting that nobody was interviewed in the area they were elected to represent. Scobie looks like a chubby kid who's wearing an ill-fitting school uniform. well, Sunday lunchtime looks interesting! Was the BBC interviews about anything in particular Simon? Why Labour did so miserably mid-term! Wing Commander Guy Gibson VC, DSO (bar), DFC (bar), August 1918 - September 1944. 24 at the time of the famous raid, 26 when he died. Over 170 operations by the age of 24. What are the class of 1987/88/89 doing today? Something to ponder. Can we start a collection for Will scobie ? He desperately needs a new suit, he looks like Norman Wisdom and I keep expecting him to shout - "Mr. Grimsdale !" Tesco's do a suit for £25.00 so I hear. Simon. You have me laughing there mate. You have more front than Sainsbury's. When it's me questioning Thanet Trades Unionist credentials you say I am libelling them !! Who was it that kept Electricians Union out of Petbow ? Boilermakers who also had GEC Distribution Transformers. Next thing you will be reminding folks of the IRA/SWP terrorist plan to infiltrate or recruit within trades unions. You have some front. I'm still laughing. Got it on the Sky+ planner Simon. Alternative to 'Britain's Got Talent' perhaps. That is the £25 suit. I am beginning to get quite upset with the comments on this blog concerning Will. He visited my daughter's school and everyone was inspired by his achievements at such a young age. Her classmates were very happy to learn that you don't need an expensive education, you don't need a great intellect nor have studied at a decent university, and you don't need any work experience to be able to achieve high office in Thanet politics. It's not like he's bumming off the state. I see that the driver is still seeking a colour he likes. He has gone green now, let's hope he never takes a fancy to blue. Not bumming off the state?Actually, who pays his fees etc. as a councillor, not the council tax surely? 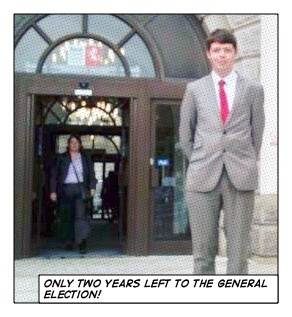 I see that the boy is not the youngest county councillor. A lad of 18 was elected to Cirencester council two years ago, and now at 20 is elected as a county councillor, and also mayor of Cirencester with his father as deputy. Lib dems both. In effect what you are saying, 8:14,is that Will Scobie does not have a great intellect, did not go too much of a university, has no real experience, but a well positioned daddy. Isn't that exactly what most other folk are saying? About the young Scobie and his suit: Well Caligula made his horse a Consul. It was said he did this to show the others who was boss- funny coves, politicians. Simon, I shall be watching on Sunday. I wonder if the decision to single you out for an interview in the rain is indicative of BBC leftie bias. That's probably what is wrong with politics in the UK. Very few have any work experience yet achieve high office. All elected representatives in my opinion should have spent at least five years in paid employment and be at least 30 years old before being allowed to stand for election to a council or parliament. Perhaps then we could avoid the problem of unforseen consequences. Cllr Harry Scobie (presumably Will's father) describes himself as being actively involved in politics since the age of nine. I find this a ludicrous statement. But I suspect it is nothing more than a bit of CV enhancement aimed at the tribally gullible. At the age of nine I was actively involved in fighting off baddies as variously a cowboy, soldier, Mountie and Robin Hood. I was also actively involved in medicine with games of Doctors and Nurses. Similarly, I was actively involved in family social studies with games of Mothers & Fathers. Most of this active involvement took place in Ellington Park. Can Harry not speak to Will of the Scobie Clan to sort himself out. He's a mess. Oxfam have better suits stocked. Want to borrow a fiver Will ? I see his (Will's) corporation is already being formed.